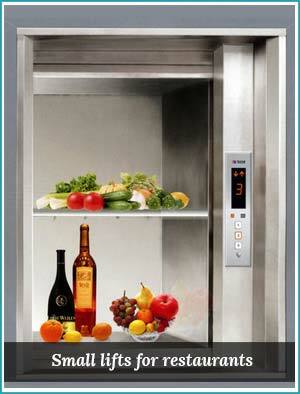 Dumb waiter (small lift) manufacturer in India at best prices. 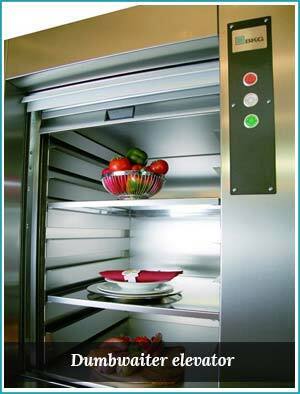 Small lifts installed in kitchens for transferring cooked hot food, dirty utensils, raw materials, etc. to various pantries at all floors in multistoried hotels, large households, marriage halls, restaurants, etc. Dumbwaiters for kitchens are usually made of stainless steel so that they are not affected by steam, hot food, water, etc. Dumbwaiters are also used in hospitals and departmental stores to carry stores to various levels in the building. These can be of S.S. or M.S. The capacity starts from 20 Kgs onwards as desired. Sizes are from 1?' x 1?' to 3' x 3' or even larger as required. Only about 10" extra space is required in the building to fit this lift. Only one wall is required to support the smaller lifts. The entrance can be protected by either a swing window or vertical biparte doors.